STORMWATER is water from rain, snow, sleet, hail, that flows across the ground and pavement or when snow and ice melt. The water seeps into the ground or drains into what we call the storm drain system. The addition of roads, driveways, parking lots, rooftops and other surfaces have prevented water from soaking into the ground has greatly increases the runoff volume created during storms. This runoff is swiftly carried to our local streams, lakes, wetlands and rivers which has caused flooding and erosion. The also wash away important habitat for critters that live in the stream. Furthermore, stormwater runoff also picks up and carries with it many different pollutants that are found on paved surfaces such as sediment, nitrogen, phosphorus, bacteria, oil and grease, trash, pesticides and metals. 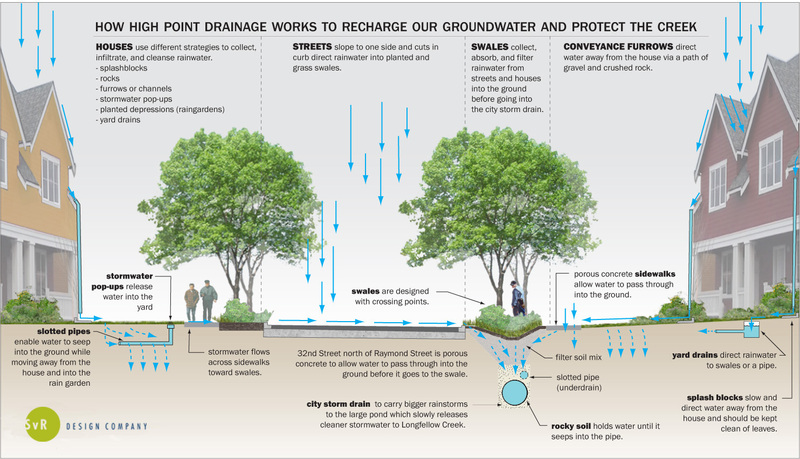 How to Reduce Stormwater runoff? 1) Low-Impact Development (LID) is a stormwater management approach that seeks to manage runoff using distributed and decentralized micro-scale controls. 2) Green Infrastructure refers to natural systems that capture, cleanse and reduce stormwater runoff using plants, soils and microbes. EPA has put out a list on Stormwater Management Best Practices that explain in detail a variety of ways to treat and store stormwater at a regional and site scale. This blog post is well organized and structured. It gave good points on what stormwater is and what we could do to fix the problems that accompany it. The links posted are very helpful in explaining in depth the topics discussed in this post. Possibly including an image of a hydrograph and an explanation of it would further benefit this post. This is a great article that serves as a baseline for educating the masses in stormwater and how to manage it. The effectiveness of the visual organization of the article also helps engage the reader without exacerbating the subject to something that sound “science-project-ey.” The relative comprehension of this article to the general public is a compelling way to bring about the issues of stormwater runoff. Storm water runoff is a huge area that has been redefined through the years. Every bit of water we can hold in the ground or at the containment facilities is a plus. Drought, global warming, and poor water retention facilities are a fact that we are trying to plan for and correct in the ways that we can. I know you have a big interest in water and are heavily involved in the water processes. You are putting the facts and some links out there. I guess I was hoping to get from your post is where you stand and some of your ideas and attitudes.